A day course to enthuse and inform you of easier and time-saving ways to grow great food. The garden is 40% beds with vegetables planted in the spring as well as some perennial plantings, and 60% second plantings made in summer and early autumn. I explain how we propagate and plant all of these, and you learn examples of succession. We check progress of various experiments, including the two beds of dig/no dig. Undercover, the polytunnel is finishing its summer vegetables, and salad seedlings are propagating in the greenhouse, some already planted, for cropping through winter. We look at compost making, and examples of compost at different stages in my compost bay. Also I show you examples of bought compost and animal manures, and I explain their benefits and uses. In the greenhouse I demonstrate the value of becoming skilled at propagation, how little space you actually need to grow hundreds of plants at a time, and thousands over the season (should you need to!). You learn time-saving tips in many aspects of growing, from watering and plant care, to less weeding, and increased harvests in relation to the time and space given. Yield per square metre is a key goal, to save time and effort. The no dig approach underpins all my courses. Its the most fantastic and simple way to care for soil and all its inhabitants. They repay you by helping the growth of healthy plants, with less pest and disease to worry about. Nonetheless there are often birds, insects and rabbits wanting our food: I show ways to prevent damage. 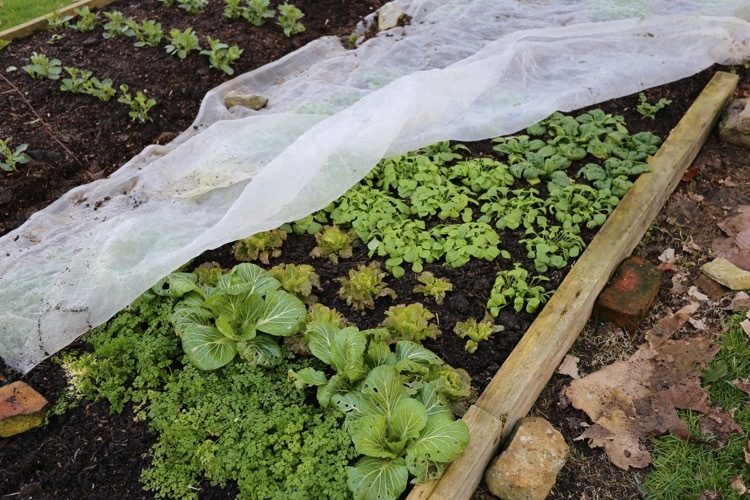 For example, you will see the use of fleece covers for early plantings, which speed growth as well as keeping pests off. Homeacres courses are an opportunity to learn from an acknowledged master of his craft, in a group of no more than twelve people. Refreshments are all included, not least the fine lunch of home milled bread and more vegetable dishes than you normally see at one meal, crafted by Steph. Thank you for making such informative videos! Your channel makes gardening so much easier. I can’t stop watching these videos. Far better than any gardening programme on television. Now I just need to get a garden of my own! I started no dig after coming across Charles’ You Tube videos and deciding to give the weed supression “hocus pocus” a go with some well rotted compost I had. I spread this on some rose beds and another flower bed that would take me a total of about 3 hours to weed once a month, prolific deep weeds on a heavy clay base. I could not believe the results. Weeds did come up but 15 mins of hoeing and all gone and now hardly any….plus the roses and plants looked the best they have for seven years. I was totally bitten!!! I came on a course last August, and it has given me so much direction and understanding in my gardening thinking. And your updates through the winter are an absolute tonic. @charles_dowding has changed my life! I tried for so many years to grow veg, read loads of books and just made a lot of slugs very happy. In 2016 I decided to give it one last try before packing it in. I religiously followed his book, sticking to exactly the varieties he recommended. I followed his sowing times on the monthly Newsletter and the difference in what I can grow has been phenomenal! Having regular pickings of salads like this at this time of year used to be a far off dream!